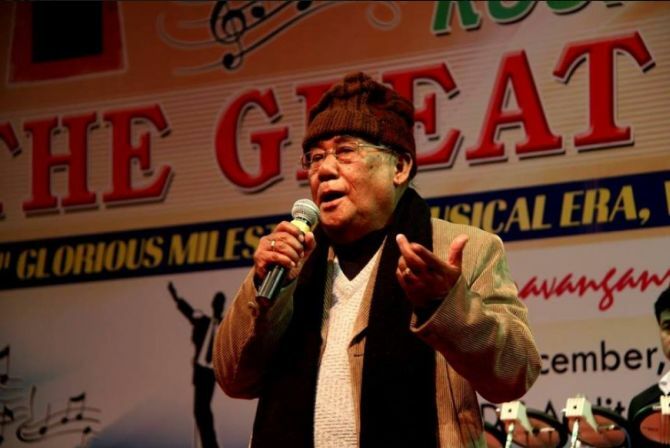 Even as the north east continues to be in a state of turmoil over the Narendra Damodardas Modi government's Citizenship (Amendment) Bill 2016 granting citizenship to Hindu refugees fleeing prosecution in neighbouring countries, Manipur film-maker Aribam Syam Sharma has announced his intention to return the Padma Shri in protest. 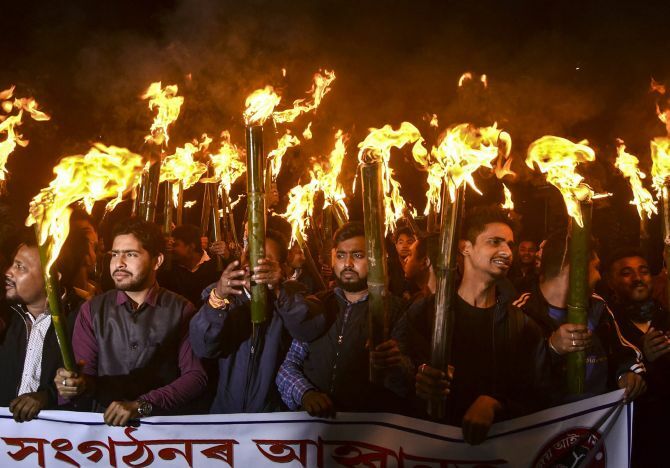 The Citizenship Bill, which has been passed by the Lok Sabha, has met with overwhelming protests in the north east, and stoked fears among the indigenous populations that if the bill were to become law they will be swamped by an influx of refugees from neighbouring countries. Aribam Syam Sharma, below, tells Rediff.com's A Ganesh Nadar why he opposes the bill. Why did you decide to return your Padma Shri? I am 83 years old, what else can I do? I follow Gandhiji's ideology. It is a peaceful protest to tell them that I don't like this particular bill. If they want to help foreigners, let them absorb them in the bigger states, where they cannot make a demographic difference. Let them stay in the Himalayas, like the Tibetans in Dharamshala. Don't let them stay here where they can alter the demography. There was so much armed insurgency in the north east in the past, why are they inciting the people now? Why are you opposing the Citizenship Bill? This bill will have a tremendous effect on the small states in the north east. Manipur has two MPs in the Lok Sabha and Rajya Sabha. We cannot do anything in Parliament. We have only 29 lakh people, which is less than the population of some districts in Uttar Pradesh. Nagaland, Mizoram, Tripura and Manipur will be affected most. In Tripura, the indigenous peoples are already in a minority. Bangladeshi immigrants are the majority there now. The same thing will happen in all the small states if safeguards are not put in place. The demographic change will not be visible immediately. It will take three years for that to happen. We will become the minority. The north east people are complaining, but the BJP is not listening to our voice. Violence may ensue among the locals against foreigners. They are thinking about people in other countries, but charity begins at home. They should first think about the Indians here, and then about those living in other countries. I am not against the BJP. I am against this bill. There are 29 states. The smaller states should be secure. There should be equal weightage to all states. Do you oppose the bill in its entirety or because it favours some religions and does not apply to all? The government does not have a majority in the Rajya Sabha, so the bill may not become law. That is why I am worried they will use the ordinance route. They can also do it in a joint sitting of Parliament.